Tricks for balance, strength and coordination - definitely the tricks that my dogs do most often from all the tricks they know, as a part of their conditioning program and their warm up routines! 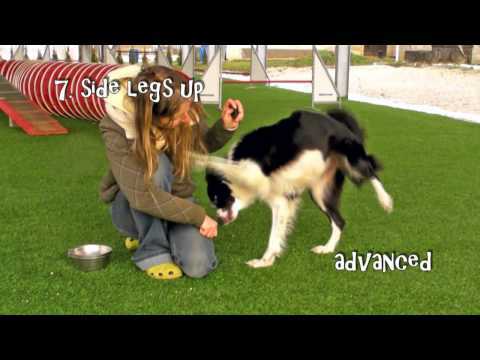 Tricks are definitely a perfect way to keep your dog fit, injury-free and fast and agile on agility course! No, not at the moment… -- But again in November! 🙂 Good luck with your puppy plans!!! Try to proof his stays until a release with first just with your movement + hand gestures as if you’re tossing -- without actually tossing it. Once he knows to stay until a release, try dropping food too, but just drop it at first -- and cover it with your hand if he leaves the position. Then make it harder gradually, making it more&more of a toss next. Is this DVD a good idea for a displasic dog? or should i go for one of the other 2 tricks dvds? Depends on how severely dysplastic? If the dog is in pain, then these tricks are not appropriate. But if the dog isn’t having problems and it’s just X-ray that show dysplasia, then it’s actually great as building more muscle means less stress on the joint. Yes, tricks for strengthening would be great for her then!